Been a month since my last post, I know, I promised to do better too. Well a lot of things have happened since then so I’ll tell you about some of them. I had the stitches out of my hand and it is healing nicely with very little scarring. The other good thing is that the dogs and I are healthy with no signs of rabies so that’s a good thing. I took the dogs to be neutered. No, this wasn’t revenge for being bitten, they were going to be done at some stage and we had been putting it off because it had been hot in the summer but Jenny was going to go back to UK for three weeks or so and that would have made it at least another month so I decided to get it done before she went. Surprisingly it went fairly smoothly. I was expecting a lot of shenanigans from Wilf but he went as calmly as you like. Then next day I took Alf. I had asked the vet for a pill to calm him down because I would not have been able to get him there otherwise and it would have upset him a lot. Well he went into the surgery ok and had the anaesthetic injection so I then left him and went around Kas taking some photographs. 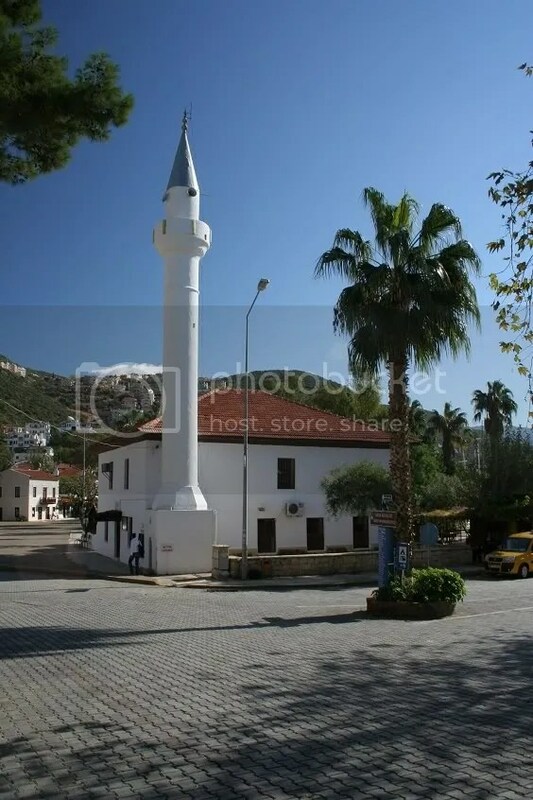 Here’s one of them, the Mosque by the harbour. When I went back an hour later the vet hadn’t finished and it was another hour before he did. Well I was pretty worried about Alf for a few days after that but he has recovered from it and it now running around limping on one or other legs as usual. In the end they both seem to have recovered from the operation and things will hopefully settle down with their fighting in a couple of months. Ramazan and I have been working hard on the drive, just now we are trying to do the entrance from the road but the rain is slowing us down a lot. We can’t work during it of course, there is usually a big thunderstorm, lightning and heavy rain and then for a couple of days afterwards the ground is too muddy to work on. Just when I think we’ll do a bit more it rains again! Jenny came back from UK and then broke a filling in one of her teeth. She went to a dentist in Kas but it wasn’t done right and she was in a lot of pain so she decided to go back to UK again to get it done by her own dentist. She is still there at the moment and hopefully will have it sorted out fairly soon. While she has been there I have bought a new lens for my camera which she is going to bring back for me. She will bring a few other things back for me so the visit has benefits for both of us. My brother Robin had his fifty fifth birthday yesterday 19th Nov, Happy Birthday to you Rob. Unfortunately I couldn’t ring him because we were having another big thunderstorm and I had to disconnect all the power leads and the telephone plug . We have to do that because the lightning destroys electrical appliances very easily here, I already had to repair the phone/fax and it won’t take soldering together again. By an amazing coincidence I got in touch with a long lost friend of mine from the days when I served in the R.A.F. at Troodos in Cyprus. Glenn Surtees was a big mate of mine there and it was great to get in touch with him again. We have been swapping stories and pictures since. The last bit of news is that I bought myself a new wheelbarrow today, a Yaparlar 2000. Sounds exciting doesn’t it?